Roberto’s life was dedicated to building the “Beloved Community” through multi-racial unity and he deeply believed that poverty, racism and social inequity could only be eradicated if people of all races came together to do so. In honor of Roberto and his legacy, the Third Annual Roberto Felipe Maestas Legacy Award will recognize two individuals, a woman and a man, who have exemplified Building the Beloved Community through multi-racial unity and working to eliminate poverty, racism and social inequity. El Centro de la Raza will celebrate them and their contributions by making a $1,500 gift in their name to an organization of their choice. Award recipients will be recognized at El Centro de la Raza’s Building the Beloved Community Gala on Saturday, October 5 at the Washington State Convention Center in Seattle. Legacy award applicants can self-nominate or be nominated by someone else. Recipients are asked to participate in a video interview and attend El Centro de la Raza’s Building the Beloved Community Gala. Deadline for application submission is Tuesday, July 9 (Roberto’s Birthday) 2013 at 5 p.m. Pacific Time. Click here to access the application. 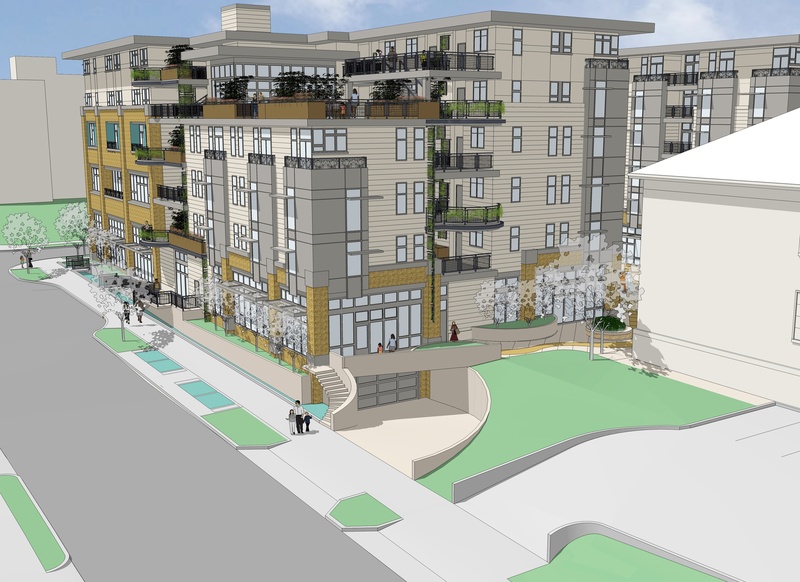 A rendering of a design for the 17th Avenue South side of the Plaza Roberto Maestas project. Kate Gill de la Garza of the Beacon Development Group wrote to let us know that the design review process for El Centro de la Raza’s south lot development, Plaza Roberto Maestas, will be delayed by a month. The Early Design Guidance meeting is now scheduled to take place on July 23 at 6:30 p.m. at Wellspring Family Services, 1900 Rainier Avenue South. See previous information about the project here. 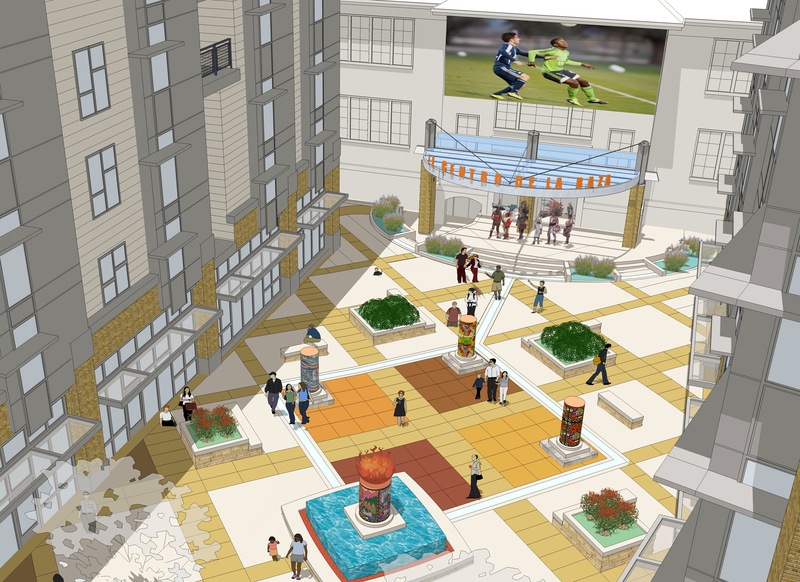 A proposed design for the plaza and stage at the Plaza Roberto Maestas project. In late February El Centro de la Raza presented to the community its latest designs for Plaza Roberto Maestas (PRM). We have been delayed in getting this post out to the wider community by the significant fight for State housing resources for this project in Olympia right now. PRM is the mixed-use community-inspired transit oriented development project that will be built on El Centro’s currently vacant south parking lot, next to the Beacon Hill Light Rail Station. It will be 113 units of affordable housing over 30,000 square feet of daycare, multi-cultural community center, retail/restaurant and office space. The latest design renderings incorporate feedback gathered from over ten community meetings and focus groups that took place in 2012. ECDLR just scheduled its first City of Seattle Early Design Guidance meeting for June 25th at 6:30pm at Wellspring Family Services on Rainier Avenue. This meeting will kick off our permitting process and is open to the public. A rendering of a design for the 17th Avenue South side of the project. 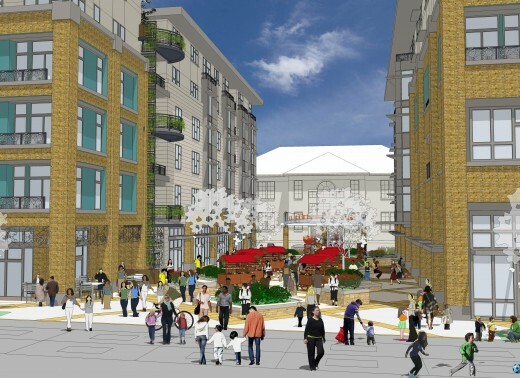 Plaza Roberto Maestas will be built in the spirit of Dr. King’s “Beloved Community.” It will be a physical place that honors the history and culture of El Centro de la Raza, while serving as a “town center” gathering place for the larger Beacon Hill community to utilize and enjoy. For those that have not been able to attend community meetings to date, we have compiled this post and the following Frequently Asked Questions to maximize information sharing and community awareness of the project. In the near future, El Centro de la Raza hopes to co-host a meeting with the North Beacon Hill Council, Beacon BIKES and SDOT to talk about parking, traffic and pedestrian safety in the Beacon Hill neighborhood around this project. We will announce a date for this meeting soon. Please feel free to contact Kate Gill de la Garza, Project Manager, with any questions about PRM. She can be reached at 206-860-2491 ext. 202 or at kated@beacondevgroup.com. 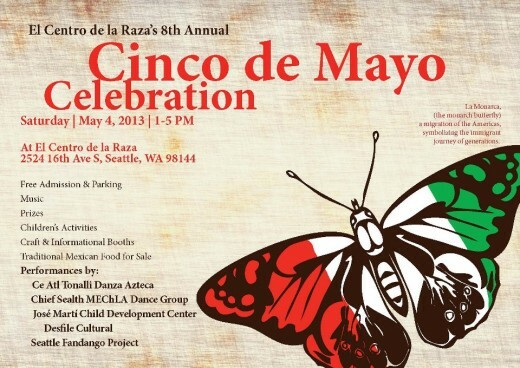 All Beacon Hill neighbors are invited to celebrate at El Centro de la Raza’s 8th Annual Cinco de Mayo Celebration this Saturday, May 4, from 1-5 p.m. at El Centro, 2524 16th Ave S., and on Roberto Maestas Festival Street next to Beacon Hill Station in North Beacon Hill. Admission and parking are free for this event celebrating Mexican heritage with music, prizes, children’s activities, craft and informational booths and traditional Mexican foods for sale. This year’s live entertainment features performances by Ce Atl Tonalli Danza Azteca, Chief Sealth MEChLA Dance Group, the Seattle Fandango Project and a desfile cultural by the José Martí Child Development Center showcasing cultural attire. See the event page on Facebook here. 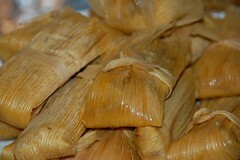 Tamales photo by iotae via Creative Commons/Flickr. El Centro de la Raza (2524 16th Ave. S.) is offering Spanish language and tamale-making classes in the next few weeks. Class fees will help support the programs and services that El Centro offers. Spanish language classes start on Tuesday, April 16, and run until June 20 on Tuesdays and Thursdays from 6 to 7 p.m. They are taught by professional native speakers in an interactive, community-based setting. Levels from beginner through intermediate are available. The tuition fee is $300. For more information, call 206-957-4605 or email execasst@elcentrodelaraza.org. The regular tamale-making class returns on Saturday, April 20 from 10 a.m. to 12:30 p.m. Students will learn how to make traditional authentic pork tamales. Tuition of $75 includes the recipe and a dozen uncooked tamales. For more information, call 206-957-4611 or email development@elcentrodelaraza.org. 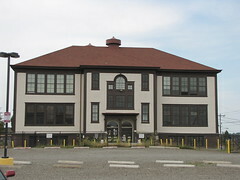 El Centro de la Raza from the south. Photo by Wendi Dunlap/Beacon Hill Blog. Jonna Bracken is teaching yoga classes at Skin Deep Dance studio on the second floor of El Centro on Thursday evenings, from 7:00-8:15 p.m. The class is open to all levels of practitioners and is an alignment-based class. The fee is four classes for $55 or eight classes for $100, but you can try your first class for free. Questions? Contact Jonna via email at jonnayoga@gmail.com. 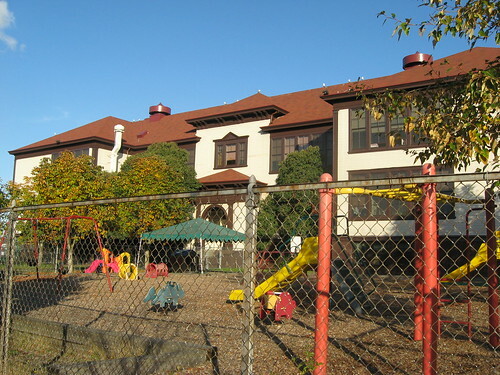 The José Martí Child Development Center is currently enrolling children aged 18 months to four years old for preschool programs with a focus on dual-language education in Spanish and English and a rich multicultural program featuring age-appropriate developmental goals to prepare kids for later success in kindergarten. Classes for kids aged 18 months through three years start on April 1. Classes for four-year-olds start on June 1. Assistance is available to fill out applications for subsidies from the Department of Social and Health Services (DSHS) or the Department of Health and Human Services (DHHS). Slots are also available for private pay families. For more information or to enroll, call 206-957-4619 or email jmcdc@elcentrodelaraza.org. As mentioned on this site last month, there is a free tax preparation clinic currently operating at El Centro. In addition to tax preparation, help is available for completing the FAFSA (application for student loans for college), applying for food stamps, utility assistance, free credit reports and more. The United Way Tax Preparation program is free for anyone making under $51,000. Bring photo ID and Social Security cards or Individual Taxpayer Identification Numbers, along with all wage and earnings statements and any other documents needed for tax filing. Tax prep sessions are open at El Centro on Tuesdays and Thursdays from 5 to 9 p.m. (English/Spanish) and Saturdays 9 a.m. to 1 p.m. (English/Spanish/Tagalog).